This nothing like my usual pages. NOTE: The diagrams are marked "No.7"... they were "there", at the IAS, while the computer was being built. I don't know that they represent the final, working design for the shift register! (RegisterS?).... but by "No. 7", you'd think they would have had something that "should" have worked. I can't see how the circuit could, though... and would like to! I can 'read' both versions. I know what the 'building blocks' are, and how they work. I think the building blocks are simple little SR latches (often wrongly called flip-flops). Only two inputs, two outputs per latch. 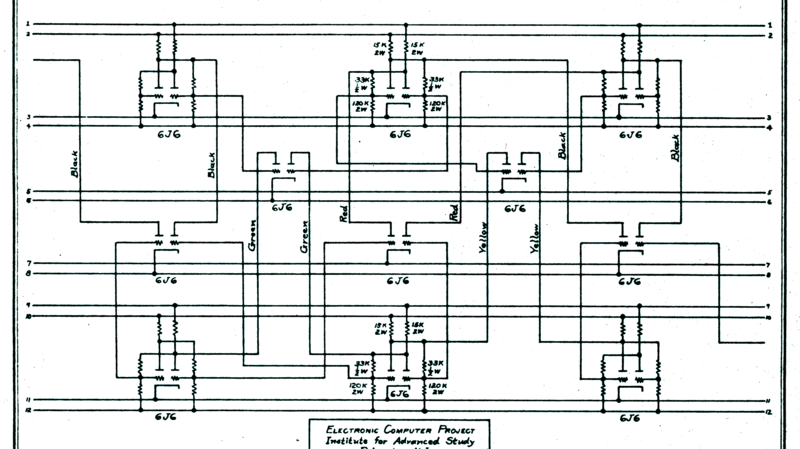 I know what the circuit as a whole accomplishes... it is a "shift register". See Wikipedia for info on SR latches and shift registers. I THINK all of this was done with LEVEL sensitive elements, not EDGE sensitive ones. I think the diagram shows only a part of the whole register. (Slightly different fractions of the whole, in the two diagrams, I think you'll agree.) I think "stuff" went in at one end... (or maybe either end.) I don't believe there was a clock signal. Possibly a huge, unhelpful distraction... As I say, I think the IAS shift register had no shared clock signal. But, for what it is worth, an article titled 'Building a 4-bit shift register from 7400 NAND gates' shows how a gated D-latch can be built from an SR latch, and how ONE SORT of shift register can be built from gated D latches. CellIn0 is where data is fed into the shift register. CellOut1 is where it comes out. CellOut1 is the input for the clock signal that drives everything. 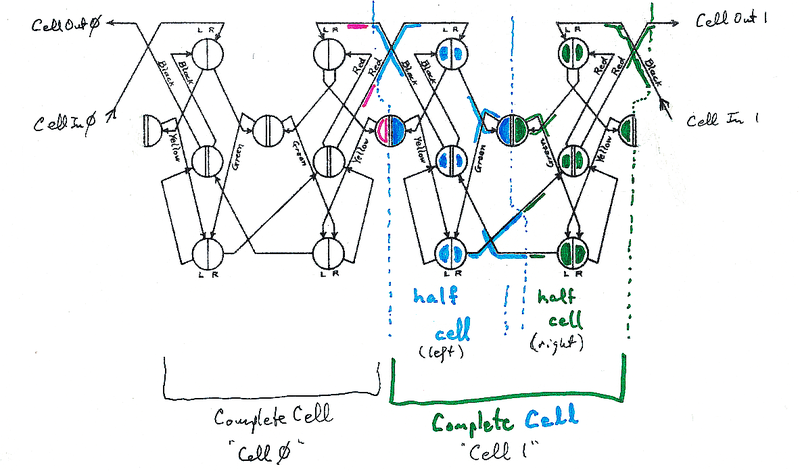 CellOut0 would matter as the input to the next cell to the left, inside the register. 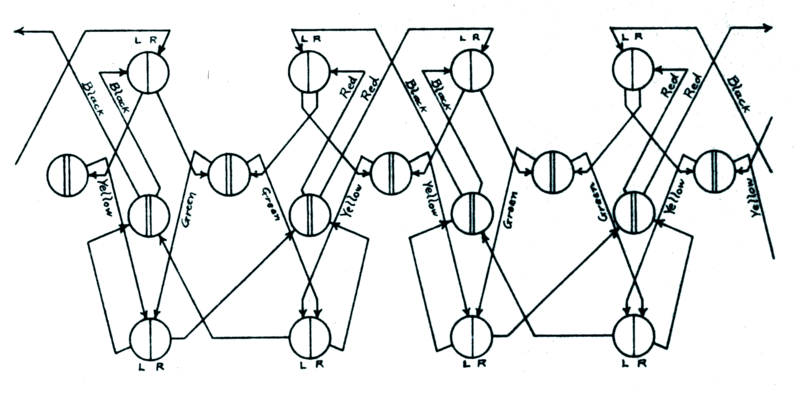 (The diagram showing just a 2 bit register). And it would either be surplus to requirements, or the signal for timing the loop, where it came out from the left-most cell. Wait for the voltage to stabilize. Wait for that pulse to work it's way through the register. Until sufficient bits have been "fed into" the register. Thoughts, contributions welcome. I will pay for follow-up phone calls.Contact details.